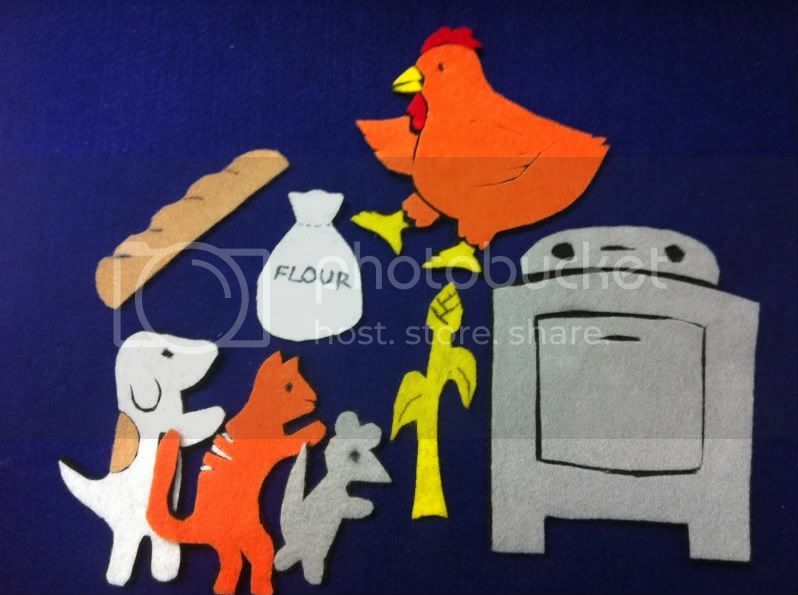 Here's my latest creation, The Little Red Hen, who plants, grows and cuts the wheat all by herself, grinds it into flour all by herself, mixes and kneads the dough and bakes it into bread all by herself, and when the time is right, eats the loaf of bread, all by herself, with no help from lazy cat, dog and mouse, of course! Recognize the cat, dog and mouse? I re-used them from my Giant Turnip set I created some time ago. The lovely hen comes straight from the pattern from my beloved Judy Sierra's The Flannel Board Storytelling Book. Oddly, there was no pattern for a stove, or a loaf of bread, so I freehanded those. I experimented with a couple of different looking kinds of bread which all ended up looking lumpy and not-at-all breadlike until I came up with this simple loaf of french bread. As a rule, I don't like to draw on my felt pieces with marker, but I think it works well here. Even though she's a "red" hen, I made her orange, as making her fire-engine red didn't look right, and made her wattle stand out less. I thought about making her all of one piece, to save a little time, but I like the extra dimensionality from having her wing and leg a little separate. This felt board went over very well at storytime. I hewed pretty closely to the Paul Galdone version of The Little Red Hen.